Also suitable for the sealed deck slat model! This 100% watertight Cargo Floor sliding floor system has been developed for the transport of environmentally burdening products that are either in bulk or compressed into bales. The system is extremely suitable for the transport and transfer of HOUSEHOLD WASTE and green waste. 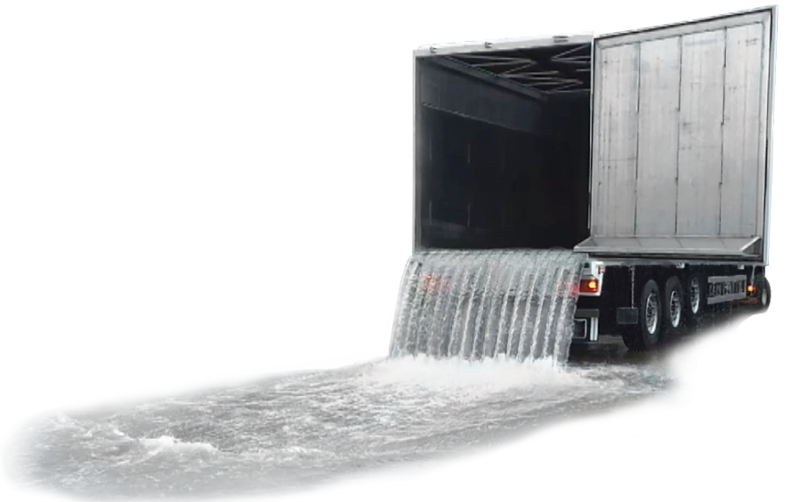 If you want a 100% watertight moving floor system in your trailer, you must then install a front mount drive unit of the CF3 LP type. The loss of loading space is minimised by the unique compact design and because the space in the front radius of the trailer is used. The slanted sealing partition also protects the drive unit. A subdeck is used in relation to the LP series that ensures that the floor is completely sealed. The subdeck can be easily installed on both a steel and an aluminium subframe and be simply screwed or riveted on to the subdeck outside the watertight section. You barely need to weld because the subdeck profiles are simply clicked into each other and sealed using silicone. The solid plastic bearing is installed on the subdeck that bears and supports the aluminium floor profiles (deck slat) entirely. The space between this moving floor profiles (deck slat profiles) is mainly self-cleaning, but can be easily and efficiently cleaned with a broom or high-pressure jetter because of its shape. It may be important in certain situations that the open spaces between the profiles are sealed so that you have a fully flat loading floor. If this is what you require, we recommend the sealed deck slat profile.